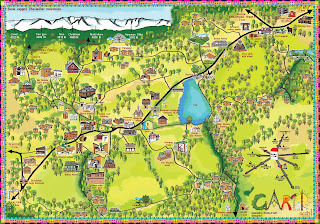 On Friday the 2nd of April 2010 “Friends of Garli” successfully launched the first ever map of Garli, the first heritage village of India. Mapping Garli is an idea the arch i team has been working on for about 3 months now. It all started from a drawing room conversation with the Lal’s (one of the prominent families of Garli) about their native village, and a few snapshots of their ancestral home in their family album. The sheer beauty of the place impressed at first glance. In the early 19th century, the hill Soods, an enterprising merchant community started settling in Garli. Along with their grand mansions, they built hospitals, schools, sarais and various infrastructures that still bear testimony to their vision over 100 years ago. It’s no wonder then that Garli continued to be the educational and medical hub of Kangra valley in the first half of the 20th century. The waterworks of the village were laid down in the early 1920’s by the timber merchant and lawyer Rai Bahadur Mohan Lal (patriarch of the above-mentioned Lal Family) for which copper pipes were brought from England, many of which still survive to this day. It was because its beauty and wealth that up until the 1930’s Garli was called the “Switzerland of India”. By the 1950’s, most of the Soods moved out into the cities for better prospects, leaving behind their grand mansions and havelis in disrepair. On the other hand this continued move also ensured that the village itself remained unspoilt, authentic and well preserved. One would be tempted to don a conservationist’s hat, and start restoring the beautiful mansions that are falling apart. But one visit to the place turned our minds around. We discovered that a newly painted and repaired haveli may not actually make a difference to Garli and its people. We got down to designing a whole new development model for Garli, the key element of which was “slow but steady!” Take it step by step, and maintain continuity. Garli was literally NOT on the map, with so many people just driving through without giving a second glance to some of its gems. 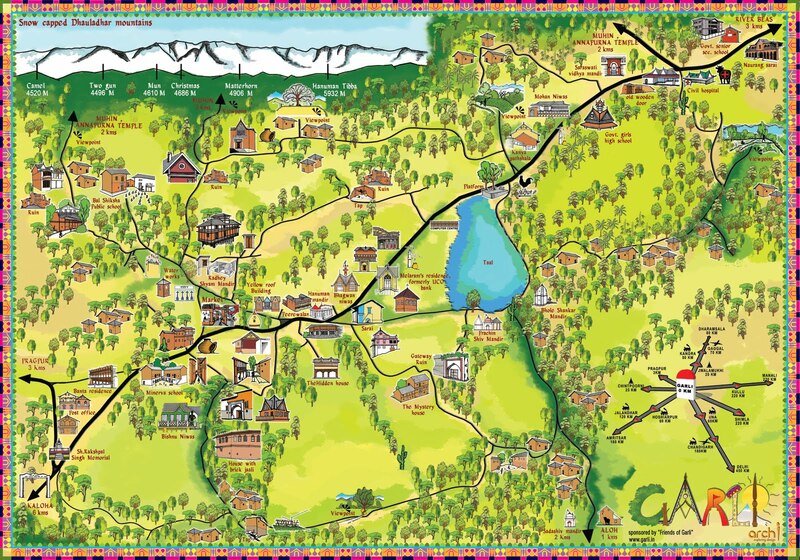 The map launch was the first step in the effort to give the village its long overdue recognition, and stimulate some interest in an undiscovered gem of India. Garli with its grand and colonial past has many myths and legends, facts and hearsay. There are stories of viceroys and Rai Bahadurs, of the bloody partition days, and of ghosts of the past. The society “Friends of Garli” and arch i will bring out some of these stories, through periodic story telling sessions later this year. For those interested in visiting this place almost suspended in time, and unlocking its mysteries, more information can be found on Garli website www.garli.in.